After 40 years, I've embraced my wavy/curly hair. I have always been a hands-off type when it comes to hair. Most days I would only partially dry the crown and pull the length into a bun. I recently decided to go with the waviness/curliness of it and cut it short to my shoulders - the problem is I went to a regular stylist who wet it and combed it straight to cut it. 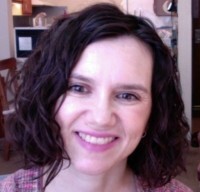 A few weeks later after reading a lot of curly styling blogs and sites I found a Deva stylist and had a curly hair cut. The stylist was great and gave me a lot of great advice and made me feel like I can/will have control over my hair. My main issue is that after what seems like and hour or so after my hair is dry, it loses curl/wave and gets dry and weird looking. I wouldn't say there is a lot of frizz, just looks like I gelled my hair to keep a messy zombie/bed head look. Per the stylist's advice I use a bit of watered down conditioner and the curl comes back but it requires a couple of hits a day to keep them. My questions are these: Is it normal for curl/wave to leave as hair dries and does this ultimately mean my hair is drier than I think it is? Is this normal? I'm getting a little discouraged going to the bathroom at work and realizing my hair looks crazy - not soft and wavy. I appreciate any feedback anyone can give. I'm not sure if all this is normal in working to transition my hair to a more curly routine, or if my hair styling handicap-ness is cursing me in my attempts to get my curls going. I have a similiar issue to you and I think it may be because of lack of protein in hair? It could be the Deva products. Not everyone's hair does well with Deva. Some people report that they get dry hair with the products because they are heavy on protein. I would try switching products and see if that helps. I also find that I need a bit of hairspray to keep my curls; otherwise, they seem to lose moisture to the air too readily. When I first started the CG Method, my waves wouldn’t hold all day either. I did the same thing you’re doing, multiple refreshes, to get it looking curly again. I think this is normal in the beginning because your hair is dry. I did protein/deep conditioning treatments weekly for over a year to try and get it in better condition. Also, like another poster mentioned, your hair may not like protein on a regular basis. My hair loves protein, but not in its daily diet. It stays moisturized much better if I don’t have protein sitting on it 24/7. Don't get discouraged just yet! It takes a lot of trial and error! I started fully embracing my waves about 2 years ago and i still have times where i wonder if all the effort is worth it, but it is! Have you tried a clarifying wash since you started? Build up and silicones left in the hair can cause frizz and limp curls. Also you could try a deep conditioning treatment. SHea moisture makes some great ones that aren't to expensive. I just started using the devacurl products myself about a week ago, I would suggest trying to mix in a heavier condition and see of that helps with the frizz, or don't rinse out all of your one condition delight. Frizz is usually caused my lack of moisture. If you feel like you're getting to much protein from the deva curl products, shea moisture makes some great sulfate free cleansers as well. I rotate my DevaCurl shampoo with shea moisture or As I Am coconut co wash because I don't think my hair needs that much protein so frequently. I have also noticed with my hair over time is that if I don't use enough gel, my curls don't last. Hope this helps at least a little and good luck! !